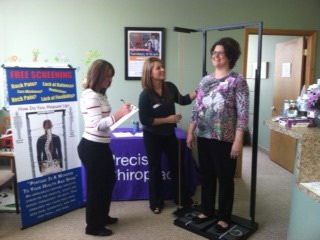 As a part of this program, we come out and do FREE posture screenings at businesses in our area. We bring in a machine called a Spinal Analysis machine. It gives the person standing on it a great visual of their posture versus perfect posture, as well as a right to left weight distribution. There’s no touching involved and no electricity required for the machine. We go out in the community to give health and wellness talks such as speaking at Beaumont Hospital at their Trigeminal Neuralgia support group or presenting lunch and learns at businesses in the area. We love meeting new people in our community and reaching out to those who need our help. Give Lea, our Community Outreach Assistant, a call to schedule an outreach event at (248) 680-7200.